Hurricane Norbert which is now causing concern in the Eastern Pacific just off the coast of Baja California is now starting to force cruise ships to alter itineraries. Regent Seven Seas has cancelled scheduled calls to Cabo San Lucas today (September 4th) and tomorrow the cruise line has cancelled calls at Puerto Vallarta. This is to keep ships away from the developing Hurricane which is moving up along the coast. 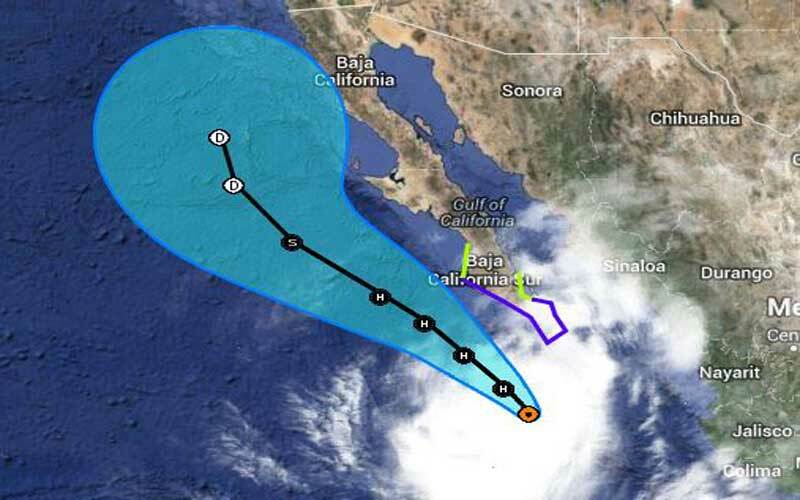 Hurricane Norbert currently has maximum sustained winds of 85 mph and is at the southern tip of Baja California. The Hurricane is moving north-west along the west coast of Mexico. It’s 155 miles away from the coast but could still cause ocean swells and strong winds on land. NOAA is expecting the Hurricane Norbert to head in a more northern direction in the coming days and will continue to head up along the coast of the United States. The Storm is moving at 7 mph and is expected to stay as a Hurricane for now. but could be down graded to a Tropical Storm by Sunday. As the storm heads towards popular cruise ports more cruise ships could be forced to cancel calls or change itineraries. Cruise Hive will keep readers informed if any other cruise lines announce changes.